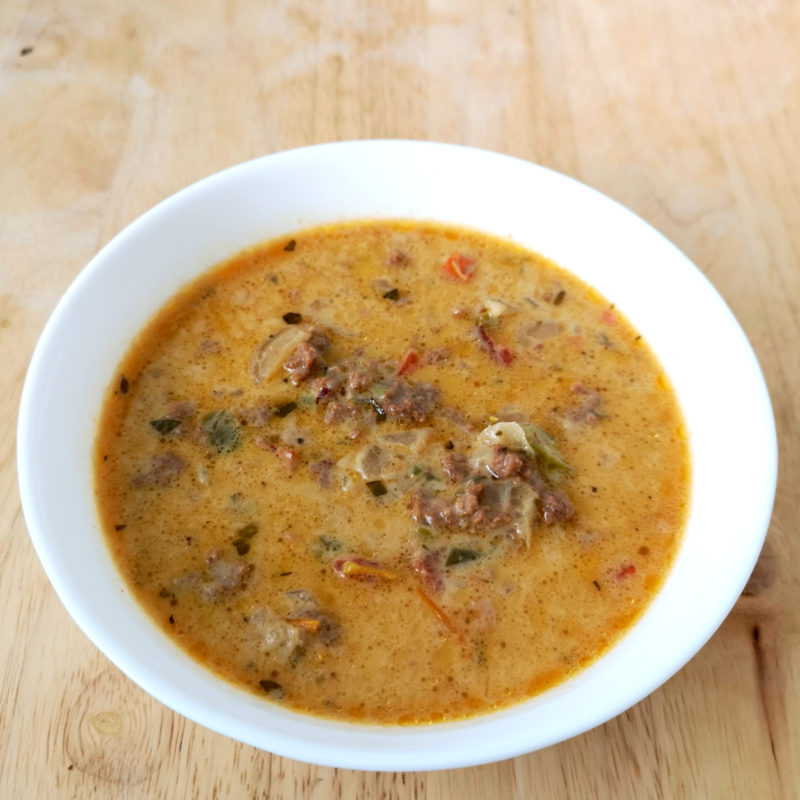 Hubby sent me a link with a slew of low carb soup recipes and going through them I was inspired to make a hamburger soup that was a combination quasi taco and cheeseburger soup. The spices are quite simple and I mostly used my rub (which has everything in it anyways), and if you wanted to make it full taco soup, one could add taco seasoning and more cheese. And you’ll probably cringe, but I used Velveeta slices. For one, it’s the Hubby’s favorite cheese (I know, I know, and I still married him! ), and two, it melts perfectly. It also makes for a great grilled bacon and cheese sandwich, but that’s a different post. Some cheeses tend to get greasy or separate when in soups, and Velveeta doesn’t. Since I didn’t have a block, I just ripped up slices and it melted just fine. Place the lardons in a cold and large soup pot and render the fat out of the lardons. When the bacon is about halfway cooked, add the onions. Sprinkle with some fresh ground black pepper and Mrs. Dash. Saute until the onions become translucent. Add the oregano, garlic, and pickled jalapenos and saute for about 5 minutes. Add the ground beef, sprinkle with the all-purpose rub, and brown the beef. Once browned, add the onion mixture and stir to combine. Add the stock and let simmer for 15 minutes, stirring occasionally. In a medium sauce pot, bring the cream up to a soft simmer. Add the cheese slices a few pieces at a time, stirring constantly. Once all the cheese has melted and been incorporated, add cheese sauce to the soup pot. Simmer for an additional 15 minutes, stirring occasionally. At this point, add salt if needed and let simmer for a few minutes to incorporate.